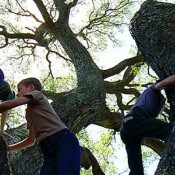 Landscape has always been character in the films of Terrence Malick. The even, rolling fields of “Days of Heaven,” the sweatily green hill ladders of “The Thin Red Line,” even the dry-toast mesa of “Badlands”: all expansive, overwhelming environments that dictate the behavior of the films’ human occupants through sheer force of presence, for it’s often all they have to live in and live with. It’s an approach that, across 33 years of widely-spaced work, has drawn as many accusations of vacant pictorialism as it has rapt devotion — without the mystique Malick has accrued through his slow-loris work patterns, it’s difficult to say which camp might have emerged dominant — but it’s made for an oeuvre with a stylistic and textual throughline that belies its scattered production. Until, that is, “The Tree of Life,” Malick’s long, long delayed fifth feature that is at once his most interior work and his most grandiosely conceived. A fractured, impressionistic memory album documenting the roots of familial estrangement in a middle-class 1950s household in the director’s hometown of Waco, Texas, it arrives on the screen surrounded by bookends within bookends: scenes depicting the present-day social alienation of the family’s grown eldest son (Sean Penn), bracketed by vastly scaled sequences addressing more generalized concerns of theology, evolution and mortality. It’s the first of Malick’s films to feel like the product of more than one purposeful creative urge; his first to preferentially separate its thematic concerns from its narrative ones, such as they are; his first, to balance my opening gambit, in which character is allowed to become landscape. His most open-armed and structurally undisciplined film to date, it might yet prove his least rewarding. Malick opens proceedings with a heavy hint as to the broadness of his conceptual brief by quoting Job 38:4-7, a Biblical passage in which God asserts full creative ownership of our planet with something approaching defensiveness: “Where were you when I laid the earth’s foundation?” He asks, as if curtly reminding us (or the believers among us, at least) that He was here first, and that we are merely fleeting guest residents. It’s a deceptively emphatic start to a film that probes capital-letter issues of Existence with curiosity if not great subtlety. Lest we think Malick is posing spiritual statements rather than questions, the epic hailstorm of evolutionary imagery in the film’s opening act (peaking, of course, with those much-vaunted dinosaurs, vividly realized if only cursorily shown) is less than scriptural in its agenda, even as Jessica Chastain’s voiceover — attached to a never-revisited scene in which she and husband Brad Pitt absorb the death of their 19 year-old son — intones familiar platitudes about God’s hands and the old giveth-and-taketh-away rub. This opening half-hour, not unlike a further “Koyaanisqatsi” sequel with heavier effects and more ringing classical accompaniment, will likely remain the principal talking point of the film. Positively so for some — there’s no denying the visual wow factor at play here, as we hurtle through enough richly rendered constellations, rivers and canyons to fill an entire David Attenborough series — but it struck me as faintly stilted, over-determined filmmaking of the variety the director has always danced around, yet never quite succumbed to. That the narration is delivered in an ecstatic stage whisper rather heightens the sense of self-awe. If the sheer bigness of this filmmaking offers a mixed payoff, it’s followed by a reminder of what an economically sensual director Malick can be: the entire courtship of Pitt and Chastain’s character is dazzlingly navigated via quick cuts in and out of shadow: a laugh, a caress, a pregnant belly. It’s the first clue that, while the film speaks its loftier ideas elsewhere, the meat of the film lies in this domestic narrative. Perhaps something of a deflected memoir for the director, the film’s dominant middle section shrinks dramatically in scale as it sketches the relationships between the beautiful couple and their three equally Rockwellian young sons — the eldest of whom has the most trouble bending to the harsh rule of his emotionally constipated father. Largely shirking dialogue in favor of sensation, Malick paints this family portrait in free-associative scraps of anecdote and conflict, across a canvas of endless, blissed-out summer: from key events such as an abusive dinner-table argument that carves a clear divide of parental loyalty into the family, to isolated incidents as large as the death of a neighboring boy at the public pool or small as the prankish explosion of a frog on a skyrocket. Denied his usual geographical breadth, Malick and cinematographer Emmanuel Lubezki (often working in a more serene vein of the vertiginous, bob-and-weave tracking that he mastered in “Children of Men”) still conjure frame upon frame of opalescent, five-in-the-afternoon beauty. Such passages will attract the usual charges against Malick of preciousness, particularly with such arc-free storytelling — the director’s characters are rarely the most elaborately drawn, but these, Jessica Chastain’s nymph-like housewife in particular, are almost entirely symbolic. Still, filmmaking this swoonily lovely does suggest some personal reflection on Malick’s part on the unreliable elasticity of memory, even as it has little to no bearing on the grander, would-be universal themes and motifs of the introduction. Further fuzzing the question of what “The Tree of Life” wishes to say about our collective spiritual journey (perhaps it’s that the director is still open to all options, which is no bad thing, though confusing to visualize), it’s a badly misjudged finish to a film that nonetheless has sections so rapturous as to justify the six-year wait since “The New World” on their own. (That said, the film’s weaknesses may well be the result of an overthought creative process.) Malick’s slow-burn cinema tends to take several viewings to reveal its full arsenal of tactile pleasures, so I already look forward to a second encounter with his latest. At first blush, however, I’m left stimulated but unmoved, as if having watched the life of someone I hardly know flash before my eyes. Thanks so much for another brilliant review! It seems my fears of the film being emotionally distant are right, but the visual spectacle alone will get my bum on a seat. Fascinating read, Guy. So thorough in your details. What was your screening’s reactions like (all these mixed reports of cheers/boos)? There were some boos at this morning’s big Cannes press screening, though reports of them have been exaggerated — and besides, eccentric auteur statements always get that treatment from a handful of oafs at the festival. Something as widely approved as “Certified Copy” was still booed in some corners of the theatre last year. Personally I think anybody who boos at any screening for any film should be tracked down by security and have their pass revoked. It’s a revolting practice. I agree with you. Revolting is the word. Either way, great report. I believe your assessment over other twitter reactions. I really wonder how the rest of the reviews/box office will go down. From what I’m hearing both here and on the Playlist, it sounds like this might be a little tricky for Academy attention. Not that that’s a bad thing; at the very least, I’m glad to hear generally positive things, given how disastrously high expectations + secrecy + long delays can turn out. Did it feel a little indulgent? Peter Bradshaw creamed, Sukhdev Sandhu snorted and other critics reactions, including yours, are everywhere in the middle. I am interested to see it though I dunno how marketable the film is to release around the world. I dunno if the Palme is likely. You know, every single rave & negative review (just read Zacharek’s, though it’s not a pan) makes sense to me. This is going to be one of those films that you won’t know how good/poor it is until you see it yourself and decide is if it’s good or not, for YOU. The constants I keep reading are that Pitt & the cinematography are good/great. I also hear nice things about sets, costumes, sound, fx, & score. I haven’t read glowing things of Chastain; more ‘solid’ stuff. And then, of course, depending on who you are, you either find the film magnificent or pretentious, with a shot of ‘nice try, Malick’. Guy, what is the likelihood of some awards love? Best Actor for Pitt perhaps? It also depends upon how far are you ready to humor Malik’s indulgences. I think Badlands is great cinema, Days Of Heaven is not. I find it dramatically inert and lacking. Brian, I doubt he might qualify as lead from what I’ve been reading. He apparently has less screen time than the trees and the grass. So supporting yeah, because he is indeed getting magnificent reviews. If you don’t, “The Tree of Life” won’t change your mind. 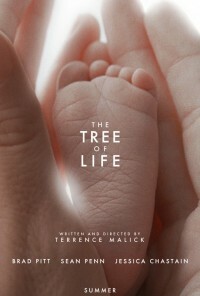 Considering the fact that his last film, which was met with somewhat divisive reviews upon its premiere, is one of my favorite movies of the 2000’s, the reviews for the “Tree of Life” are making my anticipation grow to unearthly levels. It will be interesting to see if this will pull out any awards at Cannes. In a way I’m not surprised. The New World divided people a lot, I’m sure this one will too once it gets to be seen more. I guess I’ll go in with lower expectations. I don’t like New World but I love his three other films and like some others here I am pleased to see mixed reviews. Mixed reviews is usually the best way to go into a film as opposed to going in expecting either greatness or garbage. Guy, I have a question for you about this film. I am trying not to read the reviews too deeply for the fear of spoilers but there is one thing that I think would serve as a good indicator for me. Do you think “Tree of Life” is divisive in the same way that “The Fountain” is divisive? What I mean by that is that The Fountain is very singular film that I don’t think even people who hate it can accuse of not, at least representing the vision of the director. So it becomes more of a problem them just not liking that vision/story/end result. To me there is a difference between trying to achieve something and failing and achieving something but have it be misunderstood/disliked. (I hope this makes sense). Would you say that “Tree of Life is more of a case of the former or the latter? And I kind of hope it’s the latter because then there is hope that it’s actually good. A fantastic read, I gather this move may take a few years to realize it’s full worth ….that seems to be how Malicks films are. I can’t wait to see it now . Most films I really like now I did not like upon first viewing (Fountain, Jesse James, Batman Begins to name a few). So if I don’t like Tree of Life on May 27 I’ll know it will end up being one of my favorites. Oh boy, the multiple viewings/”now I like it!” topic. That’s me. My friends always say to me. “Oh, you didn’t like it? Give it 3 more tries down the road. You’ll be telling us it’s the best movie ever”. Interesting read though the conclusive verdict eludes me. Cheers! Great read. Your Cannes coverage this year is putting a lot of people to shame. I’ve noticed there are so many object and prepositional phrases in your writing. I’ve tried to write like this, and it can be very difficult, but you do it well. Did you English teachers ever tell you to use shorter sentences? Just wondering. I ignored almost all their advice too. Great review as usual Guy, your writing is excellent as always. I’m gonna finish watching Days of Heaven and The New World and see how I feel about Malick after that. I liked Badlands but didn’t care for The Thin Red Line, so “Tree” should be interesting. I see. But what does Kate Beckinsale think? I know you’re serious but that’s so funny reading that from you. Tough Guy! Personally, I don’t see much of a difference between booing at a screening and spewing hatred on a printed page or in an online movie review but I agree that neither should be done. The only films that should be booed in my mind are the ‘Epic/Date/Superhero Movie’ people. This is a pretty funny video, and, to my surprise, Guy is in it as well. I guess it’s fair to say that Stephanie Zacharek isn’t a big fan of Malick’s work? Brian: Do you mean awards at Cannes or further down the line? I suppose it’s significant enough, and divisive enough, a film to take some festival hardware, but I have my doubts as to how more mainstream awards voters will respond to it. I don’t think Pitt has enough to do here: he’s good, but as I said, the characters are secondary to the filmmaking. Afrika: Glad you enjoyed the review! I hope it reads as measured rather than inconclusive — I’m not unsure how I feel about the film at this stage, but those feelings are decidedly mixed. John G: No, but perhaps they should have! I’ve always seen beauty in complex sentence structures, though I confess I overuse the parenthetical dash technique. Thanks for the reponse, Guy. In many ways, I got what I’m interested in. I’ll definitel see the film for myself. And I just want to make one correction to the last part of your response. When I was talking about the lack of difference I wasn’t talking about “negative reviews”. I was specifically talking about those reviews contain attention calling personal attacks, that to me have the same effect you were discibing – they are disrespectful and ruin fun for everyone. I’ll see it for the visual treat and for Malick’s thematic ebbs and flows. I do hope it doesn’t alienate me the way Koyaanisqatsi somehow did. Personally the great pieces of art in any medium art, film, music are divisive because they are affecting people like all great art should be. Who wants to make something that provokes no response from someone? Renoir’s Rules of the game was banned and dismissed as trash at the time. But now (rightly so) is considered a masterpiece. So I am glad he is a divisive filmmaker because it means he is affecting. Just like Kubrick, Ophu;s, Altman, Chaplin and Bergman. yes he belongs to that list completely.